Interesting Article. Especially, this part. "Chinese made Dhyana chips are said to be virtually identical to AMD’s EPYC CPUs"
I think the cat is out of the bag, and with a trade war heating up, we may all be buying chips from China in the next 2-3 years. What good is a license and promise when your countries are pissed at each other and in the middle of a heated trade war? Could be bad news for AMD, as they could be slapped with tariffs if it gets really bad. Even intel has major investments in China, but I think AMD would take the blunt of it. If so, all licensing and promises will be off the table, and china will just undercut the entire market.... Flooding x86 chips into every country that needs one. Pretty much the entire ryzen ThreadRipper line is made in China, and I am sure there were deals to be had to sell them in China as well. If there were no deals, I'm sure china could make as many as they wanted with or without AMD's help. All I can say is ... Trump is going to make it VERY interesting if he pushes through with his trade wars. They aren't allowed to sell chips outside of China. And China doesn't want imported chips... AMD takes a royalty and has nothing to do with tariffs. All AMD Zen-based CPU dies are fabbed in New York, AFAIK, in GF's Fab, that used to be IBM's Fab. None of them are Fabbed in China. Dhyana chips were based on 17h EPYC for engineering/sample purposes. Dhyana however is 18h and will be diverging in the first production iteration. // Fab 16: TSMC Nanjing is scheduled to commence mass production in May 2018. --> Should be noted that Nanjing in September 2017 had been upgraded from just 16nm to 16nm and 12nm. Dhyana chips are only meant to be sold and used inside Chinese borders. Dhyana can be sold anywhere AMD isn't allowed to sell. As it isn't owned in majority by AMD. Hygon doesn't have to care. You obviously don't know much about tariffs or Chinese governments. If china could slap tariffs on "ANYTHING" coming in or out of its borders. Regardless if it would hurt their jobs, witch it wouldn't since they are a global player. It would just push chip prices higher since, that price would be passed on to the taxpayer. Wink wink! Pretty much what I, and the article said, rather your beating around the bush about it. Advanced Micro Devices, Inc. (AMD) is an American multinational semiconductor company based in Santa Clara, California, that develops computer processors and related technologies for business and consumer markets. While initially it manufactured its own processors, the company later outsourced its manufacturing, a practice known as fabless, after GlobalFoundries was spun off in 2009. So since it's obvious that AMD is a fabless... So how where is GF fabing them? USA right? Of course not! China couldn't build the GABILLION dollar plant fast enough. I bet they well on their way to fabricate a million wafers per year. "When fully ramped, the Chengdu fab will have a capacity of approximately 1,000,000 wafers per year (so, around 83,000 ~ 85,000 wafers per month for the phase 1 and phase 2 when both are fully operational) and will be a tangible manufacturing asset for GlobalFoundries. The fab is meant to fulfill increasing demand from China-based developers of semiconductors, but it will also be used to make chips for other fabless companies using primarily the 22FDX process, further increasing FD-SOI manufacturing capacities of GlobalFoundries and making the tech more attractive to customers requiring very high product volumes." And Now... Let's get back to where Zen meets China! "full circle" to where it all began! Why would they tax processors designed for use in their own country? The whole point the agreement is to not rely totally on foreign companies so why would you make domestic CPUs more expensive? If anything, this is good for AMD because it means AMD is making money in the Chinese server market while Intel will be blocked out. Zen is manufactured on 14 nm (and now 12 nm) Finfet. The fab in China is tooled for older 180 nm, 130 nm, as well as new 22 nm FD-SOI production. So no, Zen is not manufactured in China. It's in your own links. Obviously it is very much based on Zen 1, as the changes for Linux compatibility where minimal. The way it looks to me, Hygon has a license from AMD to the Zen 1 core (much akin to licensing e.g. a Cortex-A76 core from ARM). I very much doubt they have an architectural license (akin to architectural licenses from ARM, which allow the client to design their own ISA compatible core). As such, Hygon is not a CPU architecture designer. I suspect they just design the SoC to their liking, based on the Zen CCX design block, perhaps with a custom security processor for the Chinese market, and perhaps minor adaptations of the CPU microcode and un-core parts. AMD gets royalties for each Dhyana CPU sold (akin to ARM getting royalties for their cores sold). As Zen 2 arrives, Dhyana will be one generation behind. Both may compete in China, provided there is no restriction on AMD processors imposed. Hygon may buy a license for Zen 2, I guess, if and when it is made available from AMD. If so, AMD has the opportunity to get another round of license income. Repeat for Zen 3, etc. The Zen CCX IP block that is licensed to Hygon is probably designed for Samsung/GlobalFoundries 14LPP process. I doubt that the license allows Hygon to implement it on another process (unlike speculation I've read elsewhere, that claim that Dhyana will be manufactured in China on an FD-SOI process). However, should it be that Hygon wants a version for FD-SOI, to be produced in China, it is conceivable that AMD will do the work and license it. Which means AMD may itself introduce products based on FD-SOI. Interestingly, there is a rumour that the JV will be extended to graphics IP as well, so we could have this licensing scheme going for APUs and discrete GPUs as well. China being China I doubt AMD sees a dime beyond what they paid initially. Just think of it as a way for China to kickstart their chip development. I'm sure they are also happy to get chips without any NSA backdoors. I'm seeing some posts on other forums talking badly about AMD's lack of patriotism. Asking to be faithful to the same government that allowed Intel to almost bury AMD with anti-competitive practices that they only got sheltered in the European court. China is my favorite source of cheap used CPUs, from sites like aliexpress. Maybe did you tought that Zen was not supposed to be 22nm first? Why do you think Zen got delayed so much to be 14 nm instead 22nm which was near to be ready to appear? And 22nm FD-SOI is at worst 15% slower than 14nm FinFet... Near Ivy Bridge levels and for Chinese that is enough to start. 22FDX is slower than FinFETs without body biasing. No designer however is using FDSOI without body biasing however. 22FDX is faster than our 14LPP and is cheaper than our 28LP. 12FDX is on-par with our 7LP and is cheaper than our 14LPP. 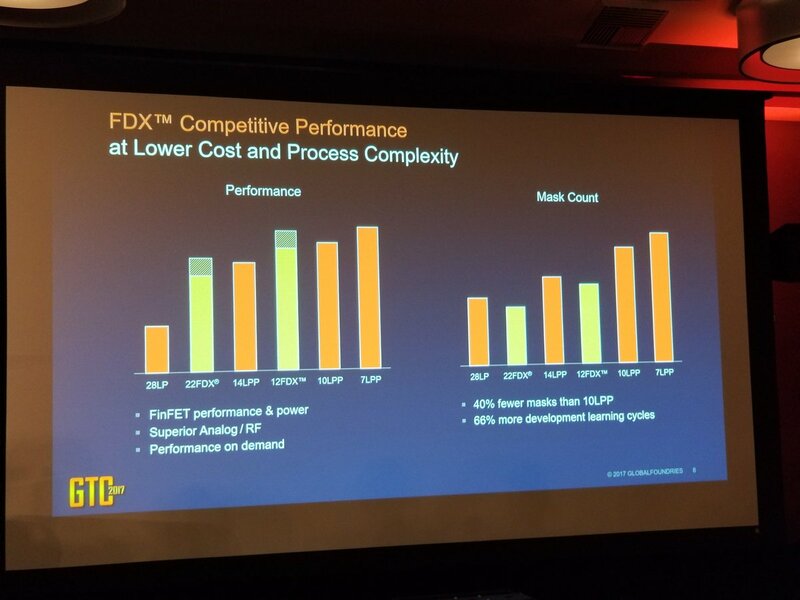 However GlobalFoundries is severally undercutting DTCO(Co-optimizer), CTI(Continuous transistor enhancement), 22FDX+(15nm BOX(with BOX creep) rather than 20nm BOX), etc. 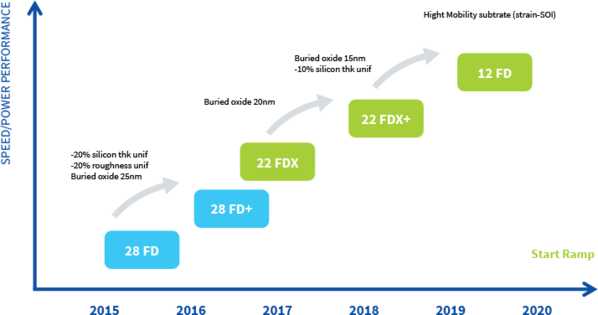 //22FDX is on the same process as 14FD(STM) and 22FDX+ is on the same process as 14FD+(STM). 22FDX+/14FD+ is everything post-license agreement. (2015~2017 in re-released 2018 22FDX+/14FD+ node), 12FDX is strained 14FD+ natively, and will have a plus version on 10FD(FMG). 22FDX+ is as fast as 16-11-nm FinFETs, with body biasing it is comparable with 10LPP. If AMD is going to run any process it is going to be HIGH PERFORMANCE. Which explains why UHP disappeared from recent 22FDX documentation; 30th June 2016 (when I found out). 22FDX+ is in between 22FDX and 12FDX. What is also in between 22FDX and 12FDX? 14LPP. What does this have to with Dhyana? Nothing. Dhyana is going to TSMC Nanjing like the ZX-E from Zhaoxin. The performance comparability is only true with small dies with low wire capacitance. FinFETs are still the best for dies larger than 150mm^2~, by Garry Patton's own words. A die shrunk Raven Ridge (still 4c and 11 CU's) might be best on 12FDX, but at the 200mm^2 AMD seems to be targeting, FinFETs still give you the best result. Even if what you say is true, it still has nothing to do with my post that you quoted or the posts that I was responding to. Unless you think that AMD is secretly fabbing some Ryzen CPUs on 22FDX in the Chengdu China foundry for some reason. The performance comparability is only true with small dies with low wire capacitance. We'll have to see, Cwire is cheaper to mitigate overall. I'll watch Oracle if they make a move to 12FDX. Asymmetrical/Asynchronous Circuit Designs seem to be the main design focus for FDSOI. Which basically does xPU within the die. So Cwire in huge designs aren't a concern to most Cryptos. In regards to China, Hygon in their non-Server/Workstation asic might use FDSOI. Competition with Zhaoxin without FinFETs. ZX-D = 187 mm squared, ZX-E has a shrink of that plus ZX-200 integrated on 16nm TSMC Nanjing. HLMC with FinFET/FDSOI phase 40,000 wafers per month. (14nm FinFET and 22nm FDSOI) <== 4th 2019 for 22FD, and 2nd 2020 for 14FF. UMC Xiamen(12,000~16,000 wafers) and SMIC Beijing(35,000+ wafers) might join the FDSOI build-up in China as well.